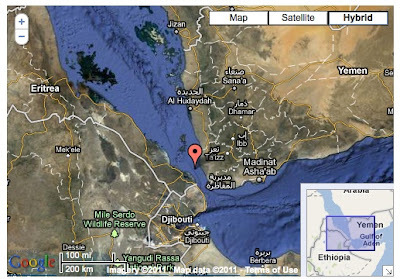 EagleSpeak: Somali Pirates: Red Sea Attack Involving Pirate "Swarm"
Somali Pirates: Red Sea Attack Involving Pirate "Swarm"
Warning from a security company reported here. 06.08.2011: 1505 UTC: Posn: 13:07.2N - 043:04.9E, Around 20nm ENE of Assab, Eritrea, Red Sea. Twelve skiffs with five to eight pirates in each skiff approached a bulk carrier underway. As the skiff closed guns and ladders were noticed. Warning flares were deployed by the onboard security team. the skiffs continued to approach the vessel at 17 knots. At a distance of around 300 meters, on the command of the Master, the onboard security team fired warning shots resulting in most of the skiffs falling back and circling the vessel. Two skiffs continued to chase the vessel and returned fire. The skiffs and the security team exchanged fire and after 30minutes and numerous approaches the skiffs aborted and moved away. We have seen pirate "swarm" attacks before. They require some degree of coordination but are designed to overwhelm defensive capabilities through numbers. We'll see if this latest report is repeated soon. A well disciplined and adequately sized security team should be capable of dealing with 12 skiffs, though. The continued pursuit after warning shots and an exchange of fire is worrisome. This particular attack is not the first time is has been seen in the region. In the last few weeks reports have been made of 5 or more skiffs approaching vessels. It was dismissed by 'some' military authorities stating they were 'sceptical' of them being pirate activity. The amount of fishing skiffs in the Red Sea/BAM/Gulf of Aden is often used as the reason for misguided reports, but when you have security teams reporting what has clearly been seen as skiffs with weapons and ladders, it is obvious that the tactic has some merit for the pirates. Were they simply testing the tactic out? The Southwest monsoon has meant the majority of attacks have occurred in those areas. Swarm tactics were attempted in 2009 when the use of armed security teams on ships was less popular and less called for (or even sanctioned). Now, they may be further tested should the pirates get some semblance of coordination going. With the concerns of more powerful weaponry possibly available through Yemen during the upheavals, the period after the storm could prove very choppy indeed. To add to Glenn’s comment; the last time I recall a similar incident occurred 12 March this year. The incident briefly appeared on MSCHOA alerts page and then was inexplicably deleted. This incident involved 20 skiffs vs a cruise ship. I suspect that the cruise lines do not want this kind of media floating around scaring off what customers remain. The vessel had an armed sec tm which fired back. “Authorities” posted the mistaken attack as “fishing in vessel’s wake”. No report if there were pax on the ship. - Where are the shipping convoys? They worked during WWI and II vs. submarines and aircraft, where are they now? Maritime insurance companies should mandate them in pirate area(s). - Along with convoys, where are the convoy escorts, such as Medium Endurance Coast Guard cutters? Smaller, faster cutters would cost less and be more effecting patrolling w/ convoys rather than big-ship navy deployments all over the place. - Why not use military assets to hit pirates at their bases and free the hostages? What is the point of having a military if you don't use it effectively? Commandos, Marines, aircraft/helicopters, etc. Why give pirates a sanctuary? If nothing else, blow up all their skiffs. There is not an unlimited supply of Somali skiffs. - Where's Interpol? The 'tail' on the pirate dog is the web of 'dealers' who traffic in information about Somali area shipping. Put these dudes in jail, stat! - Convoys again: hire some barges and use as floating air bases ... for drones. Use the drones to patrol convoy lanes. Make Gulf of Arabia/S. Red Sea into a TSS and don't allow commercial shipping outside it. I get the idea the establishment uses pirates as a sort of 'loss leader' to sell 'military products'. Time to get real, piracy is an easily solvable problem. "where are the convoy escorts" We traded the Perry's in on LCS, which while fast (see Battlecruisers, WWI, for related concept and probable end result), lack range and survivability. We don't really have anything in the inventory that fills the bill, right now. The coast Guard is already hideously overtasked, I don't forsee them having the resources to cope with Horn of Africa problems and everything else they have to do. 24 hours prior we passed through that same area and had several vessels approach in an aggressive manner. We took evasive action with CPAs of 0.5nm and less. We had heavy fog which reduced visibility to nothing and minimized our spotlighting capability. Our Secruity team was not able to engage, but definitely felt at the time that it was an attempt. I will confirm the same. The attempt was ragged and disorganized which I attribute to the fog.